Some girls dream of being a movie star. Me? I’ve got a thing for agricultural queens like Alice in Dairyland. Alice is Wisconsin’s agricultural royalty. Crowned in May, she travels the state during her yearlong reign talking up the importance of farming. 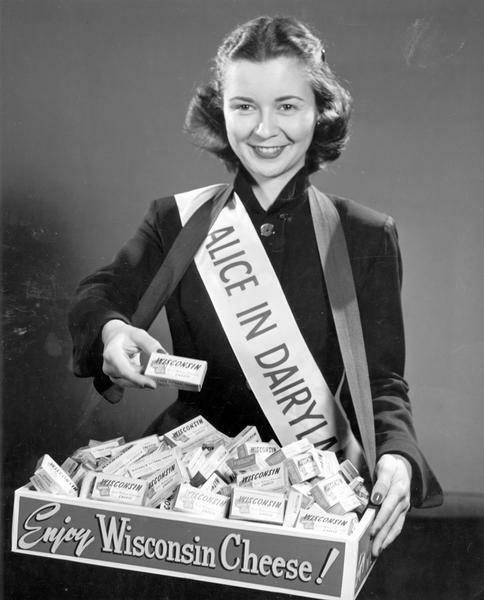 Alice in Dairyland got her start in 1948 at the Wisconsin Centennial Exposition (she was preceded by the “Dairy Queen”). Margaret McGuire-Blott had the honor of being the first Alice. Alice’s early years were a bit strange. At the State Fair, a huge paper-mache Alice would answer questions from children, while the real Alice sat backstage and threw her voice. But she also got to travel the country. Early Alices logged more than 150,000 miles a year. They went to Hollywood, rode in the Rose Parade, and danced with Lawrence Welk on TV. Today’s Alice spends most of her time in Wisconsin but she continues to make appearances worldwide. I met my first Alice at the Wisconsin State Fair in 2003 where I got to shake her hand. Our bond was cemented when she gave me a cow-shaped air freshener. This was only my first encounter with Wisconsin royalty, though. I once took a class with Wisconsin’s Honey Queen. She wore a different honey t-shirt every day. I thought at first that she just really liked honey. Wisconsin’s royalty isn’t just confined to dairy and honey, though. We’ve also got a cranberry queen, a Brown Swiss Queen, and a Cherry Blossom Queen, among others. While they may seem a little silly and outdated today, these agricultural queens have an ancient history. For thousands of years, women have been associated with agriculture and the harvest. Women have been depicted as symbols of the earth, fertility, and abundance, the very things that people hoped for their crops. The mystery of life, especially birth, was one area that women held deep firsthand knowledge, and fertility goddesses, particularly Mother Earth, were important figures in the ancient world. The correlation of fertility and the goddess found its roots in agriculture. All over the world, from Asia and Africa to Europe and South America, female goddesses represented the fruitful plains as well as the work of tending to them. The Greeks had Demeter who was said to have invented agriculture and all of the rituals associated with it. The Romans had their own Demeter named Ceres, as well as Pomona who kept an eye on the fruit trees. Hindu goddesses watched over food, the harvest, and nourishment. In North and South America, a Corn Mother gave life to the continents’ staple crop. Corn along with beans and squash were known as the Three Sisters because the plants were said to embody female spirits. This ancient connection between women and the land extends to real women, too, not just divinities. Women have long been responsible for growing, harvesting, and preparing food for themselves and their families. So Alice in Dairyland and Wisconsin’s other queens aren’t just some prefeminist holdover from the 1940s and 1950s. They are the modern incarnation of a tradition that stretches back thousands of years to people and cultures around the world. The 2012 Wisconsin Brown Swiss Queen, Allison Quick, a teenager from Oconomowoc, was at Cows on the Concourse in Madison last June.